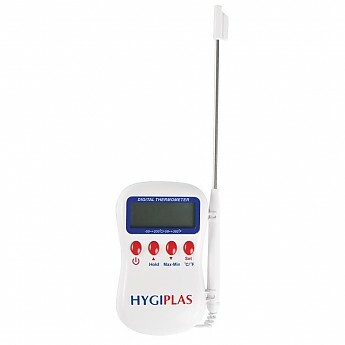 Ensure your food is at the right temperature with the Hygiplas multi-stem thermometer. Featuring a temperature range from -50°C to +200°C, the thermometer is ideal for obtaining precise readings of refrigerated or hot ingredients ’ ensuring your food is perfectly prepared and safe for consumption. Made with a large display, the thermometer is incredibly easy-to-use, helping you effortlessly measure your food. A one metre lead also allows you to measure food with the probe while keeping the unit safe from hot temperatures, making it ideal for use in any busy commercial kitchen. Declaration of Conformity included in user manual, supplied with product and available online.